The Bone node is one of the main nodes used to build a deformation rig. Each Bone node consists of a bone and an articulation. You can chain Bone nodes to create a skeleton chain for your character. The Rigging tool can be used to create and connect those nodes automatically—see About Chain Creation. (x) Axis This is the bone x-axis (horizontal) coordinates for the resting position. (y) Axis This is the bone y-axis (vertical) coordinates for the resting position. Rest Radius This is the articulation's radius value (articulation size) for the resting position. Rest Orientation This is the bone's orientation angle for the resting position. Rest Bias This is the articulation's bias (roundness and smoothness) for the resting position. Rest Length This is the bone's length for the resting position. 2D Path When this option is enabled, the X and Y-axis parameters are controlled by the same 2D path function. 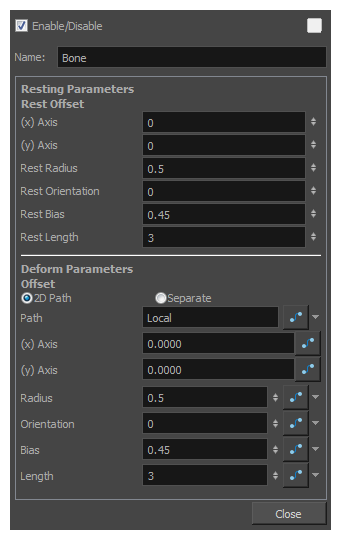 Separate When this option is enabled, the X and Y-axis parameters are individual one from another. Path When using a 2D Path, this field displays the name of the function. (x) Axis This is the bone X-axis (horizontal) coordinates for the animation position. This parameter can be linked to a function to be animated over time. (y) Axis This is the bone y-axis (vertical) coordinates for the animation position. This parameter can be linked to a function to be animated over time. Radius This is the articulation's radius value (articulation size) for the animation position. This parameter can be linked to a function to be animated over time. Orientation This is the bone's orientation angle for the animation position. This parameter can be linked to a function to be animated over time. Bias This is the articulation's bias (roundness and smoothness) for the animation position. This parameter can be linked to a function to be animated over time. Length This is the bone's length for the animation position. This parameter can be linked to a function to be animated over time.